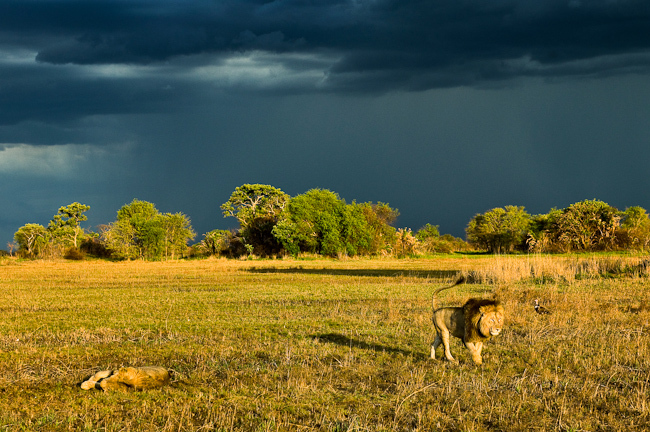 Busanga Bush Camp lies in the heart of the Busanga Plains, a wildlife paradise that is situated in the northern region of the Kafue National Park, one of the largest national parks in Africa. The Busanga Plains covers an area of approximately 750 square kilometres and is one of Zambia's most significant wetland resources and also one of the few areas in the world that remain untouched by development and human activity. Wilderness Safaris owns and manages Busanga Bush Camp. Busanga Bush Camp, in the north-western section of the Busanga, is about as 'wild' as you can get in today's world, with an unfenced mosaic of expansive, grassy, seasonal floodplains and "dambos" (open grassy areas that will sometimes fill up with rainwater). The camp, hidden in a well vegetated tree-island of sycomore fig trees, can accommodate eight guests in four well-appointed tents. The lounge and bar area is under canvas with an uninterrupted view out over the plains; breakfast is often served here to take in the view of herds of lechwe and puku feeding. A little further back is the dining area, shaded by the canopy of a majestic tree from which an unusual lantern chandelier hangs, romantically lighting up dinner; most meals are served in the open air. There are no child restrictions at Busanga. Same-day laundry facility is included. Activities include game drives, walking safaris and night drives, led by qualified guides who are extremely knowledgeable about the area and its wildlife. As the plains dry out, this camp is perfectly situated to see large numbers of plains game such as puku, red lechwe, buffalo and wildebeest, followed by their predators, most notably lion. Cheetah and wild dog are also to be seen, while a special treat is the resident herd of roan antelope. For those interested in birding, the park boasts 491 species, including endemics such as Chaplin's Barbet.